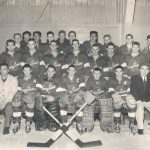 More than 25 eager hockey players showed up for the Parry Sound Junior ‘C’ Shamrocks’ 1956-1957 first try-out and practice. A number of new faces including Clyde York, Denton Vowels & Pete Cummings were intermingled amongst many of the previous year’s team members. Under the management of Alex Eagar, Matt Matthews, Roly McIsaac & Mel Guidotti, the team was formed with a combination of 10 locals and 9 imports. Travelling distances would prevent the team from competing in a regular Junior ‘C’ schedule because other clubs flatly refused to travel so far. The newly formed team began the season playing an exhibition schedule until arrangements could be made to join a northern league. The boys took no time in establishing themselves as a team to be reckoned with beating the Toronto Lakeshore Junior ‘B’ Bruins 5 to 3, including a hat trick by Ron Harris. Ivan Nicksy followed with a hat trick of his own in their 6 to 4 win over the Orillia Senior ‘B’ Pontiacs, with Gil Marks and Terry McPherson adding to the score board. Wins against the Sudbury St. Charles College Seniors and the Orillia Intermediate ‘A’ Terriers followed. 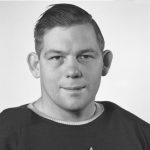 Clarence Vowels and Bob Calder both scored their first goals of the season when the winning streak continued in their defeat of the Sudbury Senior ‘B’ Frontenacs. By early December the boys began their northern league schedule in the Parry Sound-Muskoka District Intermediate Division League against teams several notches above Junior ‘C’. Unfortunately, by the end of December not only had the Shamrocks lost 5 games in a row but they had also lost their coach. Thankfully the change of year brought a change in results. With new coach Mike Kolisnek at the helm the boys were displaying more passing than previously witnessed by the Parry Sound fans. Marcel Plouffe of the Shamrocks came alive, scoring 3 of the 6 goals in their 6 to 4 win over the Woodstock Junior ‘B’ Warriors and followed up with 4 goals in their charge against the Orillia Terriers a week later. Les Tabobondung also scored a hat trick in their 10 to 4 defeat of the Terriers. The win over Orillia gave the Shamrocks sole possession of 3rd place in the Parry Sound-Muskoka Intermediate Hockey League and they were headed to the playoffs. Their glory was short lived, however, when the Sundridge Beavers took 3 straight games in the best of 5 series. Elimination from the district hockey championships didn’t slow the boys down. Coach Kolisnek and Trainers Art Frechette & Stu Carlton were putting them through 2 hours of practice each night and the fans were invited to the arena to see how the players developed their stamina and know-how. Ron Kearns, back-up goalie, was put through his paces and Keith Dickie, equipment manager was certainly kept busy. The end of January saw the boys stage a benefit game for teammate Allan Hancock who was seriously ill in a Toronto hospital. To keep the team in top form for the Jr. ‘C’ championships, they continued to play exhibition games. On the last Tuesday of February, the Shamrocks overwhelmed a combination Juvenile, Junior & Intermediate team from Sudbury 8 to 1. Our boys took a much anticipated exhibition game against the Toronto Junior ‘B’ Metro League All Stars 10 to 1 when Coach Kolisnek loaned the opposition Danny Guistini, Bob Groskorth & Bob Calder after 5 of the Toronto players had to return home following a minor vehicle accident. 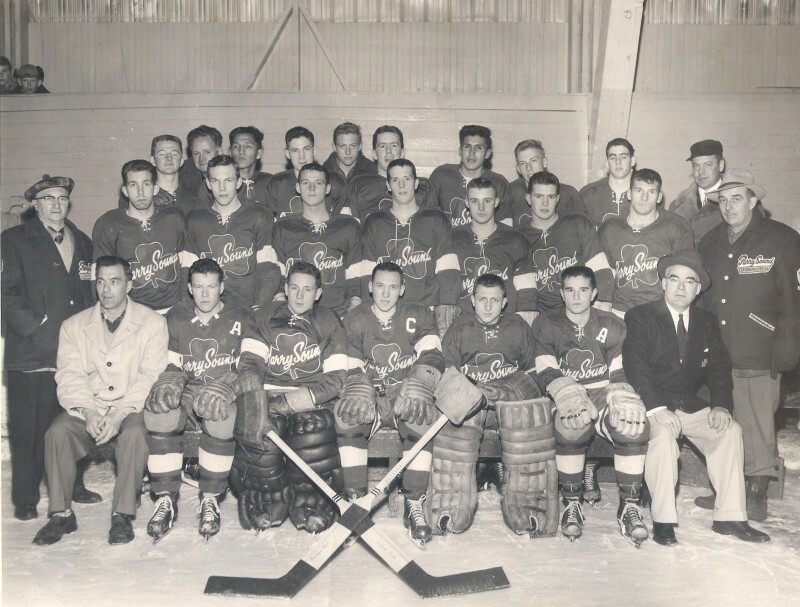 On March 27, 1957 the Parry Sound Shamrocks began their quest for the Ontario Hockey Association Junior ‘C’ Championship title. Game one of the semi-finals saw Parry Sound pitted against the Welland-Crowland Combines. The play was fast all the way with the Shamrocks having the edge, both offensively and defensively, throughout the game. Barry Purdon’s two goals helped give the Shamrocks an 8 to 2 win. 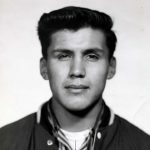 The score in game 2 proved just as lopsided when Ken Boyd tallied 5 goals and 2 assists when they laced the opposition 8 to 1. 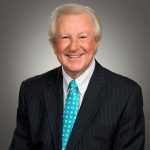 To finish up the best of 5 series, Bob Groskorth’s picture perfect goal on a breakaway at the end of the 2nd period brought the Shamrocks to 12 goals. The final was 13 to 1 and the boys were off to the finals. A crowd of 1300 was on hand at the Parry Sound Memorial arena for the opening game of the Junior ‘C’ Provincial hockey playoffs between the Parry Sound Shamrocks and the Brooklin Combines. The Shamrocks overwhelmed the Brooklin team with a triumphant 8 to 2 score to take the first of 7 series. Game two of the series moved to the Port Perry arena, home of the Brooklin Combines. The star of the game was Alfred Trotta, goalie for the Shamrocks, who kicked out many shots that looked like sure goals. Over 200 fans made the trip to watch a game that was in doubt all the way to the final whistle when Parry Sound prevailed with a 6 to 4 win. In game three the tide turned and, in front of a hometown crowd of more than a thousand, the Shamrocks fell to the Combines 4 to 2. Once Brooklin gained momentum, they pulled out all the stops to defeat the Parry Sound team again in game four. Parry Sound rediscovered their scoring punch in game five. Dave Newton scored the opener and the Combines were never contenders as the Shamrocks lead 7 to 2 at the end of the 2nd period and added 4 more goals in the 3rd. The final score was 11 to 2 and the boys could taste the trophy. Unfortunately their confidence was shattered in game six when the boys from Brooklin rallied together and once again evened the series. The final game, played in Port Perry based on the coin toss, was in front of a standing-room only crowd of 2100. The fans witnessed a top notch game that could have gone either way until the fateful 3rd period when the Shamrocks scored 5 straight and eventually toppled their opposition 7 to 2. The Goodfellow Memorial cup was presented to team captain, Clarence Vowels, during mid-ice ceremonies after the game. Celebrations continued in the streets of Parry Sound after the boys returned home. A great bonfire, stoked with an ill-fated piano that had fallen off a truck during the teams’ triumphant parade through town, blazed at the post office intersection. The team feasted on steak thanks to Alex Eagar and the festivities continued until early morning as the team and their jubilant fans celebrated Parry Sound’s first OHA All Ontario Championship.